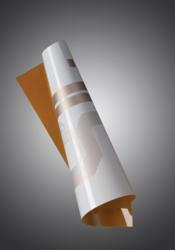 Polyonics PolyFLEX substrate shown with white high resolution printable surface. PolyFLEX substrates are highly printable, low cost and durable surfaces for printed electronics. Polyimide is the preferred material for applications requiring a high degree of dimensional stability after repeated exposure to extreme temperatures. It also exhibits a high resistance to those chemicals typically found in the manufacture of PCBs and electronic devices in general. In addition, polyimide is extremely light weight and flexible with thicknesses ranging from 1 to 5mils (25µm to 127µm). Together, these unique features make polyimide the preferred base material for printed electronics substrates. The only limiting factor is its ability to receive ink in high resolution patterns. Printing directly on polyimide has always been a challenge due to its poor ink wetting and adhesion properties. Corona treating polyimide is sometimes used, but with little success. 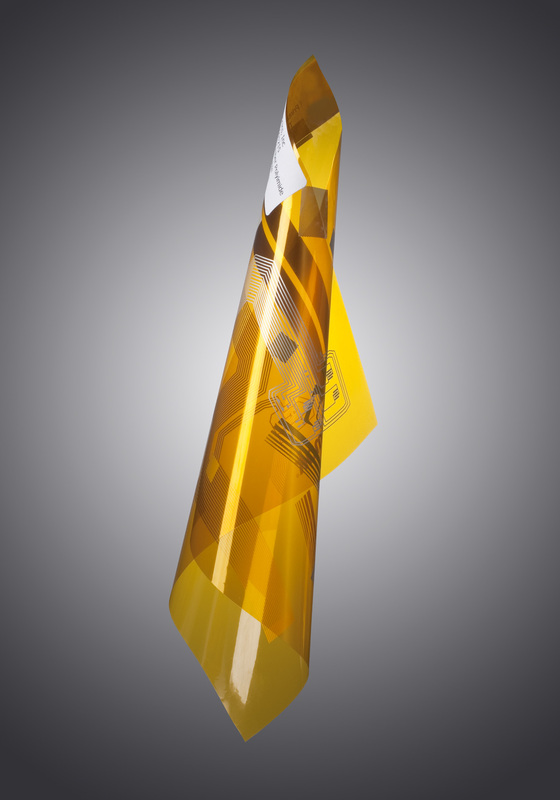 The new PolyFLEX polyimide flexible substrates include durable, top coats designed exclusively for high resolution printing. These clear and white print surfaces have been evaluated by leading conductive ink suppliers as providing increased ink receptivity, superior ink adhesion and high resolution Flexo and Screen printing. They also determined that the clarity and resolution available with these surfaces supports even the finest detail found in today's printed electronics. PolyFLEX substrates provide ideal physical, electrical and thermal properties for flexible circuits. The printable coatings incorporated in PolyFLEX are designed using ThermoGard™ technologies that and were developed for the extreme temperatures and harsh environments found in PCB manufacturing. ThermoGard technologies include unique polymer additives and chemical mechanisms that help produce dimensionally and electrically stable substrates up to 300°C and help make PolyFLEX the most durable, highest resolution and most printable polyimide films available on the market. Technical data sheets are available for each tape that outline their thermal, electrical, tensile, elongation, volume resistivity, dielectric constant and breakdown voltage values. In addition, the recognized ink systems that work well with the substrates and the durability testing the tapes undergo is presented.